I recently got word of an interesting eBay shop, where Abraham Neddermann sells a couple of unusual and hand-crafted dice. He currently offers several odd dice (like a d3, d5, d7 and d9) crafted from aluminium and an Ankh D6, where the numbers and the ankh (replacing the number 6) are made out of brass. Wow, this is pretty cool. When I had the opportunity, I asked Abraham a few questions. Stargazer: Hi Abraham, please tell our readers a bit about yourself. Abraham: My name is Abraham Neddermann, and I have always wanted to be an Inventor (I’m 28 yrs old). All my family is full of artists (aunts), tech teachers (uncles) and craftsmen (dad & granddad). I studied electronics because I’m very talented on mechanics. Always dreamed about a mill and a lathe, but could not afford it until recently (1 year). I have had an awesome luck on which teachers I have met over my life, because they all have taught me the “old school” ways of work, and love for perfection. So in the end, I have evolved into some sort of modern craftsman. I worked as warehouse assistant and lather as a R+D electronics assistant. But recently, in part due to the recession, they dismissed me (in good ways, there was not that much work). At that time, I had had just bought mi milling machine. Stargazer: How did you come up with the idea to craft unusual dice? That friend asked me for a 13-sided dice, but being a good deal of work, I redirected him to a manufacturer I found in “dicecollector.com“. Unfortunately for him, the manufacturer was not taking orders, so he convinced me to make him one. (I had to overcome my natural aversion to charge money for something to people I know). After a few prototypes (one with roman numbers, one too long, and one with off-center numbers) I finally made one he did like. I charged him 22€, but in the end, I really had not made any benefit, because had to buy numeric punches and the aluminium). So I started making all the odd numbered dice from 3 to 13. Then, some friends bought some, and about a month later, I just decided to open a eBay shop. (It has low maintenance costs and is easier to manage than other e-commerce options, but is a hell in user friendliness). At the bottom end, Unconventional Dice exists (Or I want to believe that) to make those dice noone else makes…and to push the “dice” into the future (like the carbon one…). Stargazer: Please tell us a bit more about the dice themselves. Abraham: My machines are not computer controlled, so each die is made with love and passion (well, in reality, each die is made with good music (from Loreena McKennit to Daft Punk) under my noise-cancelling headphones. As I said, I am a little obsessive compulsive when it comes to ideas. So when a “theme” kicks in, i just can’t stop to wander over it. That leads me into things like the Carbon Fiber dice, as you can see, the 3 sided dice, pushed to the extreme. In case you wander, the answer is yes, it performs better than the regular 3 sided dice. (because the mass of the dice is so off center, it is less likely to stop on a round edge). About how they handle on the table. Well, the D3 and D5, are “big” in comparison to other types of dice, but when you get into the D5 and over, all other manufacturers I have seen, just drop the common sense and make big chunks of metal with N sides. In my case, I decided I wanted the dice to be usable, so all them are small (15*25mm) and relatively light. Stargazer: And what about the numbers on the dice? How are they put onto the dice? Abraham: Which ones?. The metal dice have the numbers “engraved” (punched) on and then painted by hand to make the numbers readable. The symbols on the plastic D6 are metal fused into the plastic. That gives the die a somewhat special feeling, specially on the steampunk one (gearwheel) because the symbol has this metallic shine that paint has not. Stargazer: Thanks for answering that questions for us! I wish you luck with your dice shop and I hope we’ll see more of your cool dice at the gaming table in the future! Abraham has provided me with a couple of photos that, I now want to share with you. Please note that some of the dice shown are still prototypes, so they are not available at the shop, yet. You can click on the thumbnails above to see a larger version of the photos. I have to admit that I currently don’t see that many uses for the odd dice, yet, but I love Abraham’s other dice. Especially the Steampunk and Predator dice are pretty cool, and I am tempted to get a set of those dice, when they are finally available in his shop. Review: Printed Dice Ask The Readers: Fancy dice? Yay or nay? WordPress Dice Roller GameScience Dice Review #RPGaDay2018 – Day 21 and 22: Which dice mechanic and non-dice mechanic appeal to you? Previous PostReview: Tunnels & Trolls v7.5 Boxed SetNext PostAsk the Readers: What’s your favorite rock band? I really like the wheel spoke die. An original way of doing the numbers. What is the tree/fire/sun die for? Wow, those dice are beautifully crafted. I'd love to have and use them. Compliments to Abraham Neddermann! @Stargazer: Wow…great find! I am a sucker for dice of all kinds. The d3's (or even d5's … to double the range of the results) could be used to make interesting variations of Fudge dice (which have three sides: minus, zero/blank, and plus … you roll 4 of them at a time, giving a bell curve distribution that goes from -4 to +4; used with the FUDGE RPG). 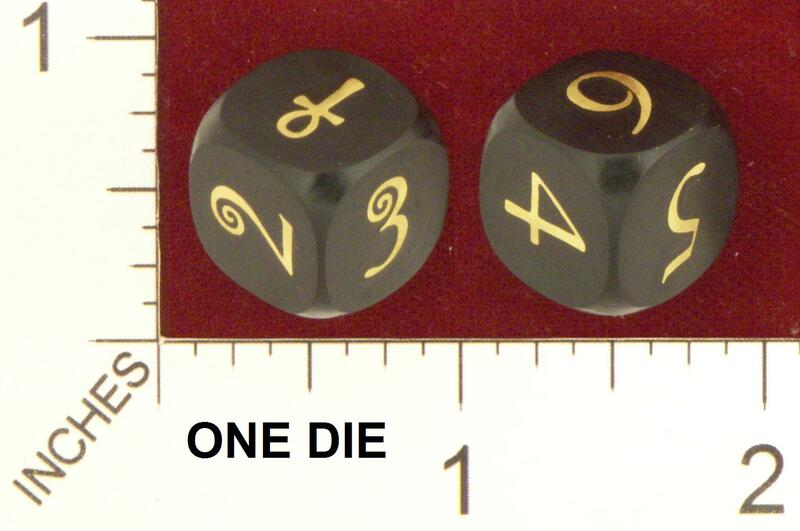 Or, you can use the d5's for a variation of the old "dueling d6's" version of FUDGE dice. You just need to somehow have them be different colors, where one color is "negative", the other color is "positive" (or one die labeled with +1 to +5, and the other die labeled as -1 to -5). Roll both at the same time. If they're equal in absolute value, then the result is 0. Otherwise, discard the die that has the higher absolute value (so, if you rolled +4 and -3, you discard the +4, leaving you with a result of -3; if you rolled +1 and -2, you discard the -2 (higher ABSOLUTE value), leaving you with a result of +1). That gives you a range of results from -4 to +4, with a semi-bell shape (I think it's actual a pyramid shape, but it's "close"). Let's take the D15, what would be it's numeric distribution from -7, 0, +7? I'm not sure exactly what I'd put on a d17 (either removing both a +/- 1, OR removing both a +/- 2). Even though I know I have ZERO need of these dice, I now have a compulsion to buy them and make a need for them. .-= Zzarchov´s last blog ..Disarming: Making combat more varied =-. -4, -3, -2, -1, -1, 0, 0, 0, +1, +1, +2, +3, +4"
Those are for a D13, not a D15. so it seems that is D13 or D19? WOW A single roller FUDGE die! That's awesome idea Johnkzin! If the probability is rightly set I'd love to have one! Also, i'd probably pay money for a set of four black FUDGE dice with the signs made out of brass. Kewl! Well…I have been making tests today…On the size I make the other dice (15x25mm), I can only fit a D15. and with fit, I really mean it. The die has a tendency to keep rolling if the table is not horizontal. Altough the die will stop normally thrown on any other surface like vinyl or tablecloth. Also, when stops, is highly readable. If any of you want more pics, send me a message through ebay. I'm not sure if I'd prefer a single d15 marked up to approximate a 4dF distribution … or just sticking to 4 d3's (where the d3's are marked -1, 0, +1). I know the d3's would be more expensive, but a d15 might be just different enough to matter. 1) What the black part of the ankh dice with brass numbers is made of? 2) What are their dimensions? Pretty simple huh? Would it be possible to make them like those ankh dice, with the plus and minus signs made out of brass? Just for knowing, how expensive that would be? @Johnkzin: Before going to bed, I realized I had not sanded the faces of the die, so the burrs helped it to roll. After sanding the die performs better, but not that much. i'll put for sale some marked as normal 1-15 die for collectors. sadly my crappy camera cannot take good macro videos for you to see. 1) The die is plastic, and the numbers/symbols/whatever is brass. It's definitely possible to make them and they should be around 4,5€ per die. If you do find a truetype font with the symbols (+ & – ) that you like , also there will NOT be any setup fees (no extra work for me). I would like to say that right now I'm out of materials (even for a single prototype) and I'm very sorry about it. I'll let Stargazer know when the materials arrive. For all who want direct updates on new dice (or materials arrival, for this time only) you can follow " Dicecreator " Where I'll post any updates related to the shop, from "fabricating" status, to new dice avaliable. And you really should consider blogging about your work or at least create a website where you post all your latest prototypes, products etc. There is even a poll for people to say wich themed dice they would like to see. .-= Abraham Neddermann´s last blog ..First production run =-.